Pope Francis visited Rome’s Regina Coeli Prison where he celebrated the Coena Domini Mass, starting the Easter Triduum. The pontiff met the sick inmates in the infirmary. 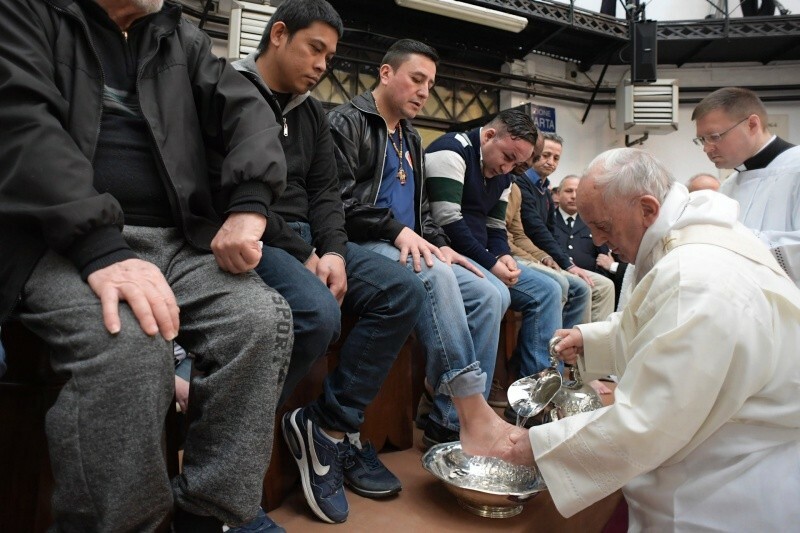 At the Mass Pope Francis washed the feet of 12 men from seven different countries: four from Italy, two respectively from the Philippines and Morocco, and one each from Moldova, Colombia, Nigeria and Sierra Leone; eight Catholics, two Muslims, one Orthodox Christian and one Buddhist. . Pope Francis celebrated Mass here in 2013, 2015 and 2017. When Jorge Mario Bergoglio was Archbishop of Buenos Aires, he also spent Holy Thursday at a prison. The Regina Coeli facility was also visited by: Pope John XXIII in 1958, Paul VI in 1964 and John Paul II in 2000. Pope Francis left the altar on which he celebrated Mass. The bronze piece is the work of Fiorenzo Bacci, a sculptor from Porcia (Pordenone, north-eastern Italy). Bacci had made it for his 50th wedding anniversary, and later gave it to the Holy Father during the general audience of 12 November 2016.